Ever since its inception, text messaging has been a driving force in the field of communication. 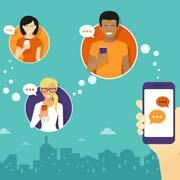 The first text was probably sent about two decades ago, and ever since then, this communication tool has only seen an upward growth when it comes to public acceptance and ease of use. Almost three-quarters of the world's population today have access to mobile phone and trillions of text messages are sent across the globe every day. Texting is the most widely used way of communication throughout the world, and is especially popular amongst the younger generations. With communication and information transfer getting faster and faster, the world is getting smaller and smaller. The obsession of people towards social media and texting is therefore changing the face of communication. This is an instant messaging mobile app which is used to send messages and IM's on devices such as smartphones, tablets, and personal computers. Line allows users to communicate via images, videos, texts, and even supports free video conference over the internet. The Line app is available across different platforms and is one of the largest used social messaging apps in Japan. Developed by a Canadian company, Kik is an instant messaging software app available on different platforms such as Android, iOS, Windows, etc. It uses the mobile's internet connection to send messages in the form of images, videos, web pages, sketches, etc. Kik allows users to register anonymously without providing their mobile number thereby preserving their identity. A popular messenger app, Kik has seen a decline in user base following the popularity of WhatsApp. Developed by Viber Media, Viber is a voice over internet protocol (VoIP) app and also doubles as an instant messaging app. It allows users to send messages in different forms such as texts, images, videos, etc. This app is available on all mobile platforms and it requires one to download on the phone first before it can be used on the desktop version. Viber gained prominence because of its quick telephony and faster access to friends and contacts unlike Skype. Developed by a Chinese company, this is a multi-platform instant messaging app. This is one of the largest mobile messaging apps in terms of daily active users. It allows users to send messages via texts, photos, videos, hold-to-talk, video games, video conferencing etc. Recently acquired by Facebook Inc., WhatsApp is an online texting app available on multiple platforms. It allows users to send messages via text, photos, videos, push-to-record audio, file transfer, and calling. Currently this app has a user base of about 1 billion people and is the most popular texting app in the world. The developers support this app by publishing regular updates which allow them to trail blaze across their competitors. TextMe is another texting app used to send messages over the internet from your smartphone. The app allows users to send texts, images, videos, locations, etc. Once you register using your e-mail id or Facebook, you will able to access your contacts and text them using this easy-to-use app. Facebook provides an online texting app to all its users for no extra cost. Facebook has a user base of about a billion people now and provides this app across platforms such as Android, iOS, Windows, Blackberry, etc. This app can also be used to send messages to friends who are not on Facebook at all, since it integrates normal SMS functionality as well. Launched by Google, this is an instant messaging app which can be used to chat with and text your contacts. Users can choose to respond to text on their personal computer as well through a Google Voice account. This app can be also be used to make free calls over the internet. Once popular, Google is slowly transferring Voice's capabilities to its social app - Hangouts, which features most user-requested features and is present on multiple platforms as well. This is an instant messaging app which has a very nice user interface and is very user friendly. The entire navigation is based on photos, hence by clicking on the contact's photo, it gives access to call, text, photo, and voicemail. Profile images are directly taken from the user's Facebook account and it provides a specific number to each account. This messaging app offers free and unlimited text messaging services to users irrespective of the phone they are using. This app is well-known mainly for its community messaging or group messaging feature. This allows the user to communicate with people in a chat room like environment. Outsource2india has been in the mobile app development for over a decade and also has been providing a series of other software development services for over 20 years now. Our team of experienced mobile app developers can develop different types of mobile apps including e-commerce, texting apps, social networking apps, grocery and food delivery apps, etc. Our experience of having worked with different clients helps us understand their business models and develop the app accordingly based on their requirement. If you have any kind of mobile app development requirement, feel free to write to us or talk to one of our representatives and we will be more than happy to help you out with a cost-effective solution.